Picasso Art + Framers are a bespoke custom picture framer and gallery trading for over 20 years. We pride ourselves on a unique and joyful experience from start to finish in creating your personal framing solutions. All with years of experience and a background in art and design. The gallery stocks established and emerging local and national artists. 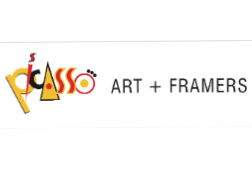 Picasso Art + Framers has a reputation for showing fine artwork and producing sensational framing at affordable prices.